In this post we cover how to build a home photography studio, based on my experience building one 18 months ago. How much space will you need? Most standard size backgrounds are 3m wide, so ideally you want a room that is wider than this. You will see in the photo, my room is about 3.2m wide at the ceiling and slightly wider at the floor (due to the odd shaped ceiling). How long the room is, is less critical. Any space more than 4m long will be plenty for most studio shots. Your key decision with backgrounds is whether you want to use paper rolls which will need to be replaced over time, or an alternative. Paper rolls work really well where you do full length model images and have a hard floor. My room is carpeted and I do very few full length shots. I chose to use muslin backdrops. These are readily available from studio photography stores or online. While you consider which type of backdrops to use, you also need to consider how you will hang them. A common choice is to buy a portable stand which they hang from. I didn’t go down this path as you need enough room to fit the legs of the stand in your room. That would have been wider than my room is. I chose to put mounts in the ceiling and hang the backdrops on standard size curtain rods. The rods are 3.1m and the backdrops are 3m wide. The curtain rods are very affordable – A$9 each from my local hardware store. The upside is that the mounts in the ceiling are very secure, and although you can’t see it clearly in the picture, it means I can hang 5 backdrops at once (one in front of the other). Step 4 is straightforward but potentially the biggest decision from a cost point of view. As you can see, I decided to get three lights, soft boxes, and stands. This gives me a variety of options for lighting a fairly small space. These are relatively inexpensive and low power. I was able to do this due to the small space, and to keep costs down. I also use speed-lites with shoot through umbrellas when I need more lighting options. It really is that simple to get started. 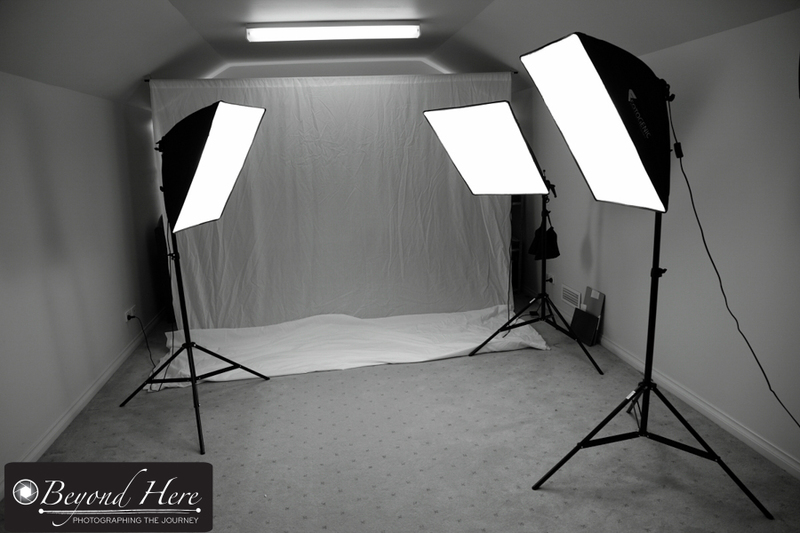 Now that you know how to build a home photography studio, its time to get to work! Do you already have a home photography studio? What were the key lessons from building it? If you haven’t built a home studio yet, do you have questions I can help with? This entry was posted in Gear Guide, Photography Tips and tagged lighting, lights, photography, photography studio, studio, studio lighting, studio photography on June 26, 2014 by Craig Dingle. Hi Milton, thanks for your comment. What’s the problem you are having with the lighting? Do you use a shoot through umbrella to soften the light from the speedlight?